Even though sales and marketing teams usually work on the same lead database, both are often at a loss to set priorities and a defined follow up schedule. In such a scenario, how can you expect a business to flourish? Marketing is responsible for generating prospects and sales is responsible for converting them into revenues. With greater levels of collaboration, both departments can contribute to greater closure rates, ultimately increasing margins and market share. Here are six ways where sales and marketing can increase their collaboration. How long is the current sales process? What are the types of stakeholders that sales representatives communicate to? What are the key obstacles like objections encountered in the sales process? Which kind of campaigns net the most qualified leads? What are the kinds of activities undertaken by sales/marketing to ensure maximum conversion? Such introspection will give you key insights that you can implement with the help of a marketing automation platform. At what point should a sales person engage with a lead, generated by marketing? At what level should marketing take ownership of a qualified lead? This will ensure accountability and a clear understanding of each other roles and responsibilities. Sometimes top managements make the mistake of treating sales, marketing as two distinct entities. Marketing thinks sales is only about achieving targets and goals; sales department think marketing is only concerned with strategy. Marketing department says sales cribs and ignores leads that they generate; sales complain about generating their own leads. The thought process of marketing is that lead generation is solely a numbers game. Sales say lead generation should involve detailed analysis of business pain areas. Instead of a sales funnel, start working on a revenue (inclusive term) funnel. Appoint BDR (Business Development Representatives) to undertake ownership of the collaboration and get the maximum productivity out of both teams. Often marketing personnel snub sales call meetings assuming that it is sole prerogative of sales reps. However, they forget that attending sales calls can give valuable insights on target audience that can help them to draft personalized campaign messages. Instead of just relying on analytic and gut feeling, marketing personnel can get real time experience of prospect behavior and more detailed information about their needs and wants. Due to hectic work schedule, sales and marketing, both ignore or give less priority to competitor intelligence. This often works to the detriment of the company. Many a times, your competitors would have done a thorough intelligence study of your company and utilized it to give a negative impression to your prospects. You can counter by having sales and marketing team work on identifying competitor points (both positive & negative) in your strong verticals and accordingly prepare a sales pitch. This pitch should present your company positively vis-à-vis competitors, with the help of case studies. Won or lost a deal? Congrats on winning and all the best if you lose. Now, get both your sales and marketing team together and list out the reasons why you won or lost. How does it help? It makes both the team members learn the best practices and avoid mistakes in future. Better yet, create a standardized template and include it in the work process to make it mandatory for compliance, after every sales closure (whether won or lost). Take care to avoid a blame game scenario though. 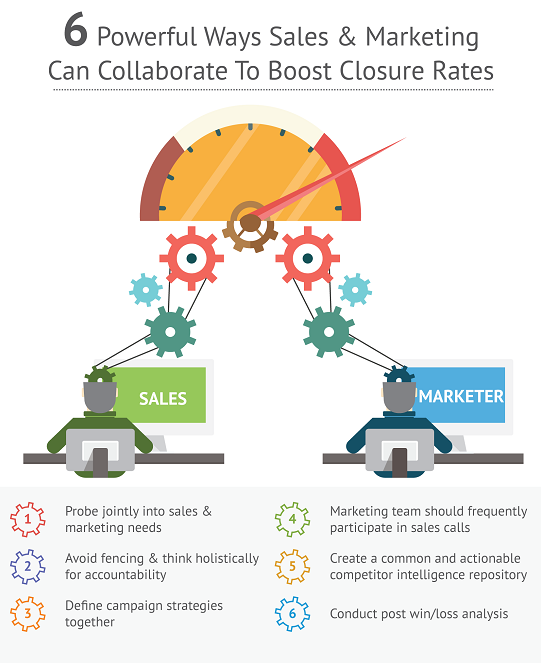 Realigning both sales and marketing, collaboratively, towards common organizational goals can achieve a positive impact on closure rates. You can even improve customer journey at very efficient costs, thus creating a win-win situation for every stake holder.